At the top of Borobodur, the world's biggest Buddhist stupa. "Each island in Indonesia is like a different country." The hard part about traveling in Indonesia is figuring out where to go. There are over 17,000 islands and endless variety. Many cultures on these islands evolved in isolation from each other, with their own distinct languages, customs, and religions. Its strategic location as a trading post also brought in a host of influences from its major merchant partners, such as China, India, and countries in the Middle East. Indonesia is the epitome of diversity. 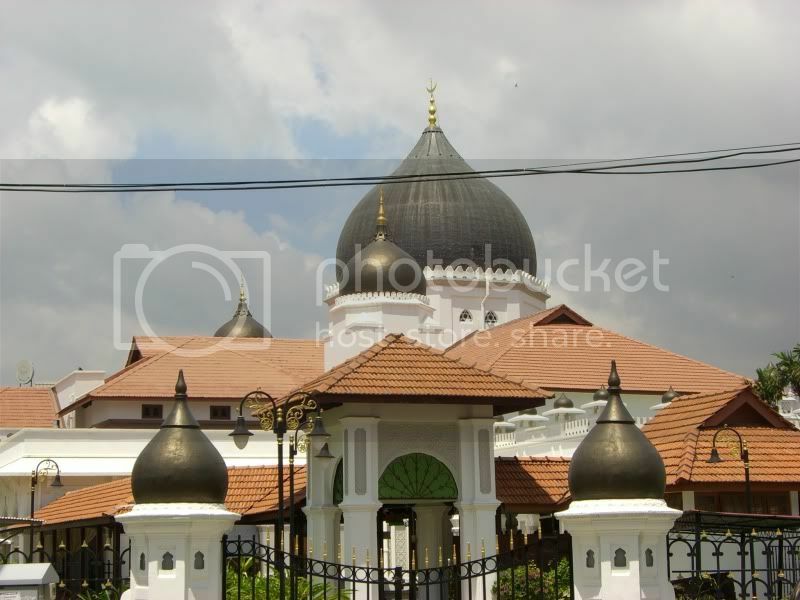 At the western end you have Aceh, which is governed by shariah law, strict fundamentalist Muslim principles. Down east there's Bali, one of Southeast Asia's premier cultural and partying hot spots. 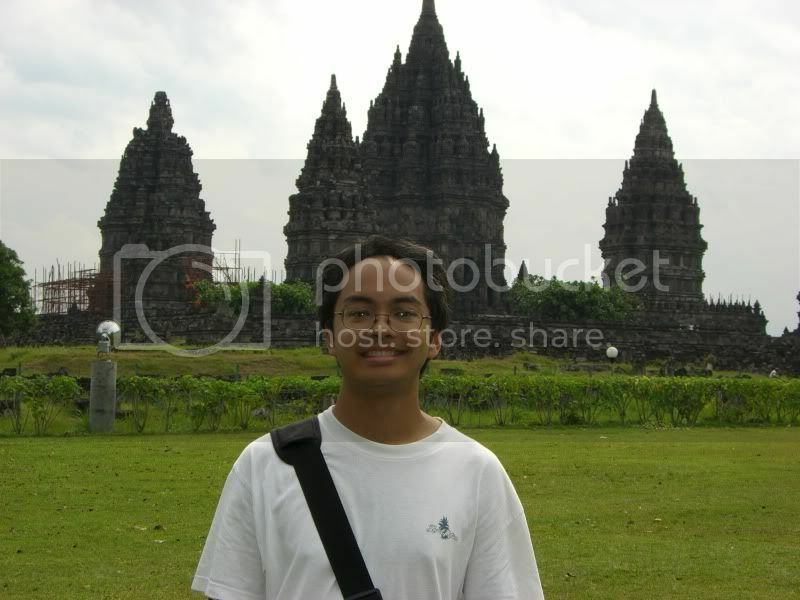 I decided on seeing temples, and focused on going to Yogyakarta (pronounced "Jogjakarta" or "Jogja" for short). It had the final 2 spots on my temple hit list: Borobodur and Prambanan. For some reason, I felt compelled to see all the great temples of Southeast Asia. Angkor Wat alone wasn't enough. My first impression of Indonesia was that it was very poor, like the Philippines, but the people were very cheerful and gregarious, also like the Philippines. The main difference is the Philippines is Catholic, due to its history as a Spanish colony. After seeing so many countries in Southeast Asia, I can see which ones are more similar to each other. Thailand, Laos, and Cambodia have much in common. Vietnam is closer to mainland China in spirit. Malaysia and Singapore share a lot of heritage. Myanmar (Burma) feels utterly unique. 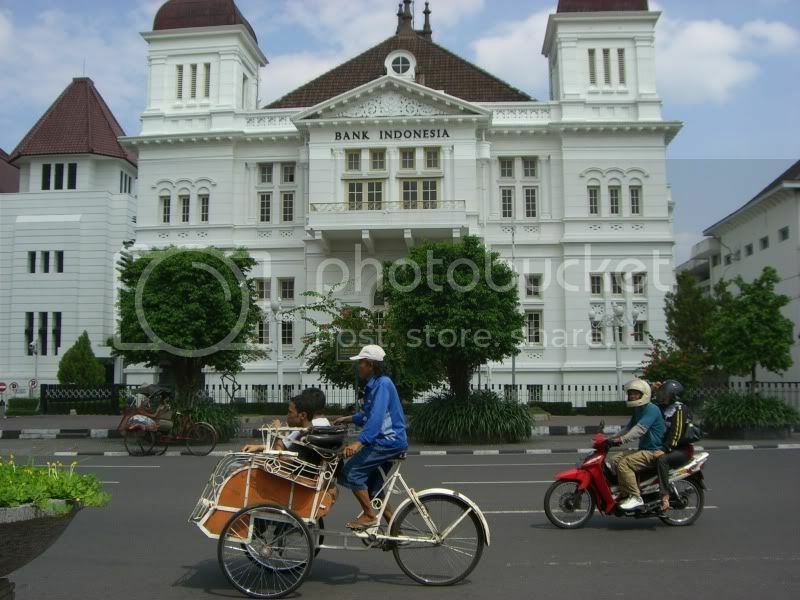 Downtown Yogyakarta, the nicest part of town. Yogyakarta reminded me of Myanmar in one sense: it's a tourist destination without tourists. There are guesthouses, restaurants, and tour companies, but not a lot of travelers. 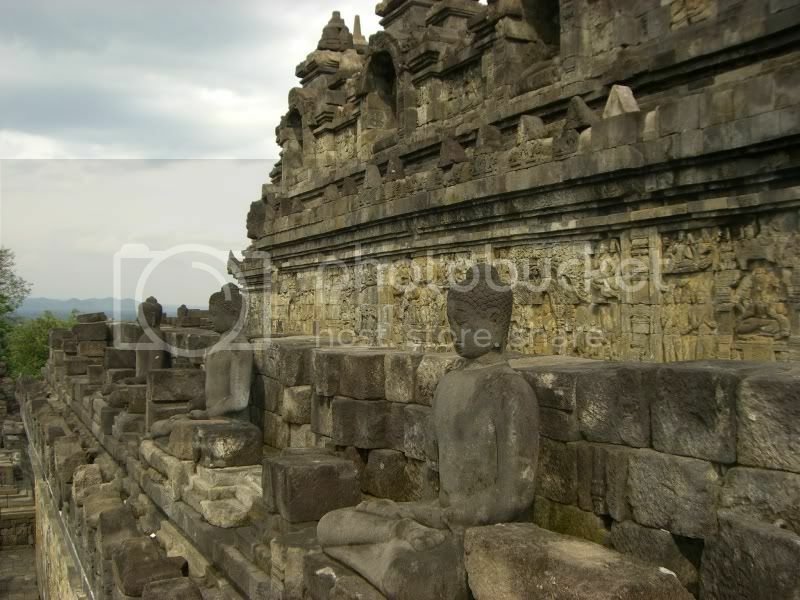 Maybe it's because I went in the low season, but I can't imagine Borobudur being as big a draw as Angkor Wat is. I was lucky to befriend two cool young Canadians, Peter and Jacqueline. They had traveled all over Indonesia, and were happy to share their tips. I imagine this was how information was shared on the road, before the Internet. You had to meet people coming back from where you're going, and ask them what's up. Peter and Jacqueline at Superman Restaurant. 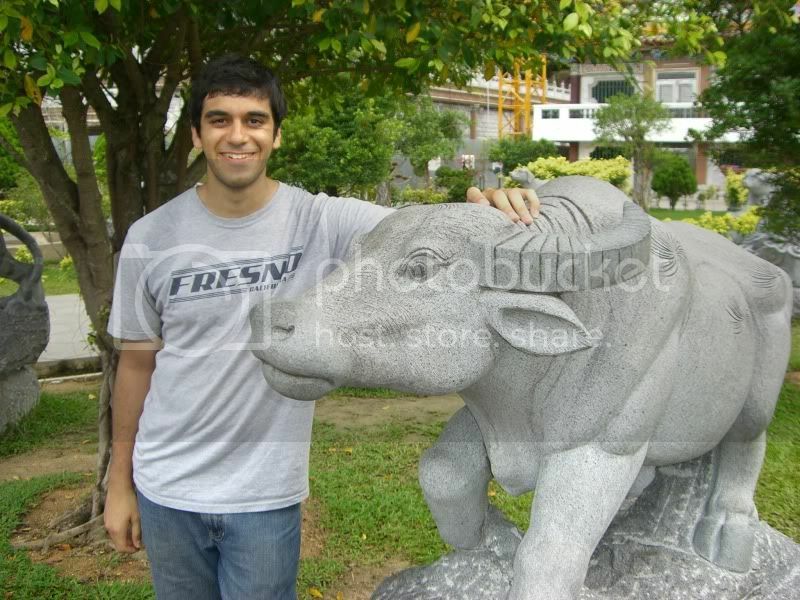 Now that I've done the full circuit of temples in Southeast Asia, I can comment on them better. Bagan in Myanmar is easily my favorite, as it's the most isolated and the main temples are quite different from each other. The barren landscape made it feel like a lost city. It was the first major temple complex I'd seen in Southeast Asia, so it had a greater impact. I'd also risked my health (and my heart!) to get there. Sukhothai in Thailand was good, and my photos came out really well. It seemed the most professionally-managed too. Almost Western-quality set-up of lights, English signs explaining each temple, etc. The lush greenery and fewer number of visitors made it feel like an oasis. Angkor Wat was my least favorite. Rampant tourism and the temples weren't as well-preserved as the other temple complexes I'd seen. One thing I did like was that the nearby town, Siem Reap, was more fun and lively than the gateway towns for the other temple complexes. Pub Street is my favorite backpacker ghetto in Southeast Asia. Prambanan and Borobudur to me almost felt like two halves of one giant temple. 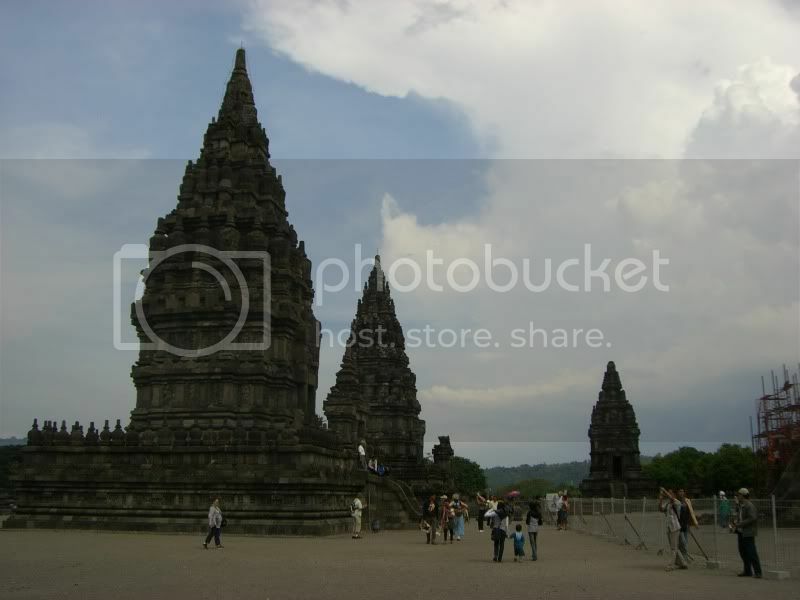 Borobudur was all foundation, and Prambanan was all spires. It almost seemed like Borobodur was the bottom half of Angkor Wat and Prambanan was the top half. 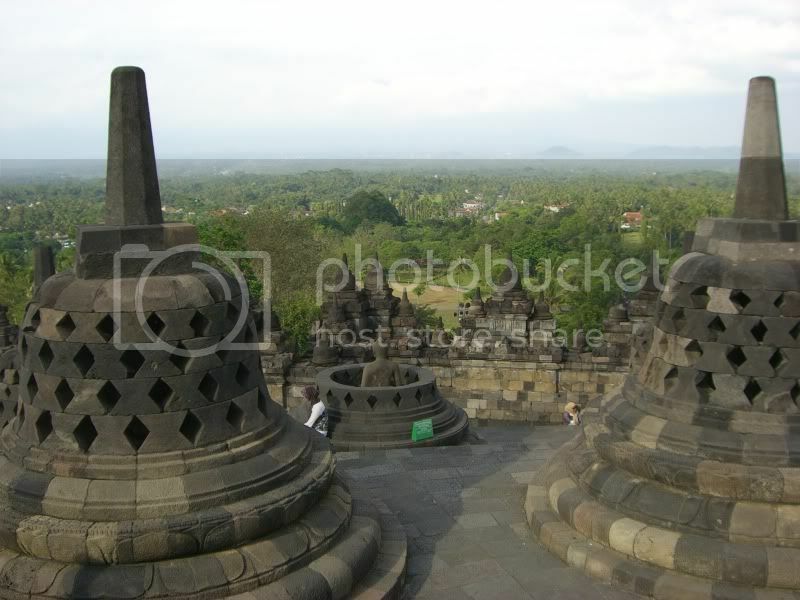 To be a little nitpicky, I don't think of Borobudur as having the world's biggest stupa. The only stupa shape is at the very top. While large, it's nowhere near as big as the Shwedagon Paya in Yangon (see photo at link). Compare the top photo in that post to the photo at the head of this post. The difference is clear. 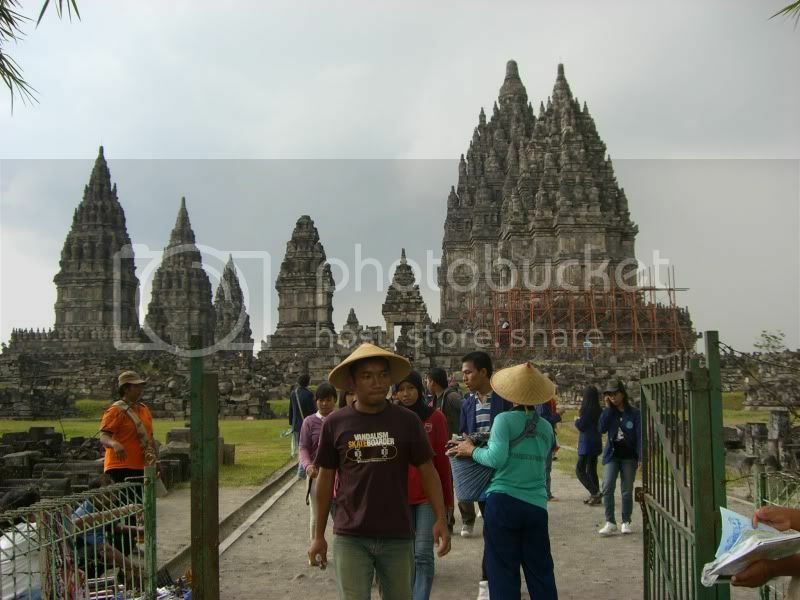 I think my photos describe Bobobudur and Prambanan better then I can with words. 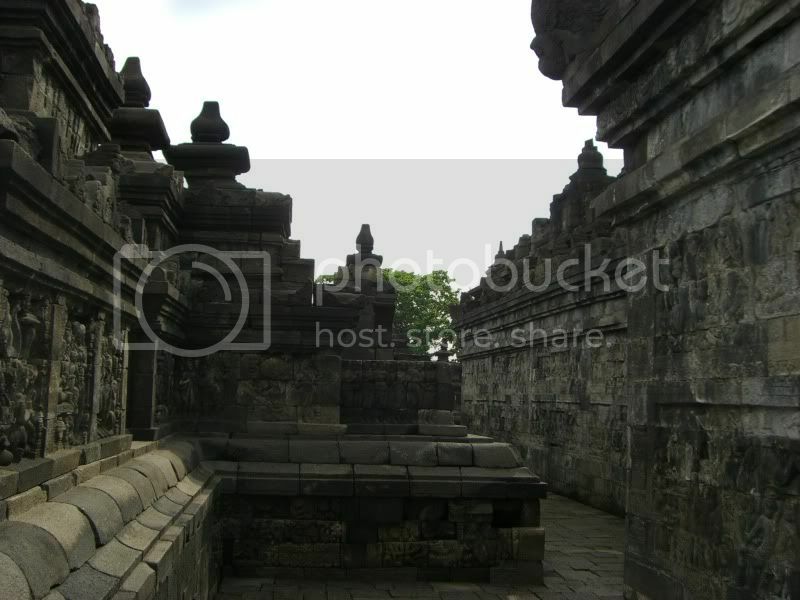 The cool thing was that there were lots of local Indonesians around the temples, but few foreigners. You can take a TransJogja bus from the airport to the Jalan Malioboro, the main street in the town. The bus station is a bit tricky to find, though. As soon as you get out of the airport. Go left, you'll pass airline counters on your left. At the Kentucky Fried Chicken, turn right and go into a building. Walk through an underground passageway until you resurface into a parking lot. Look for the glass and wood TransJogja booth. 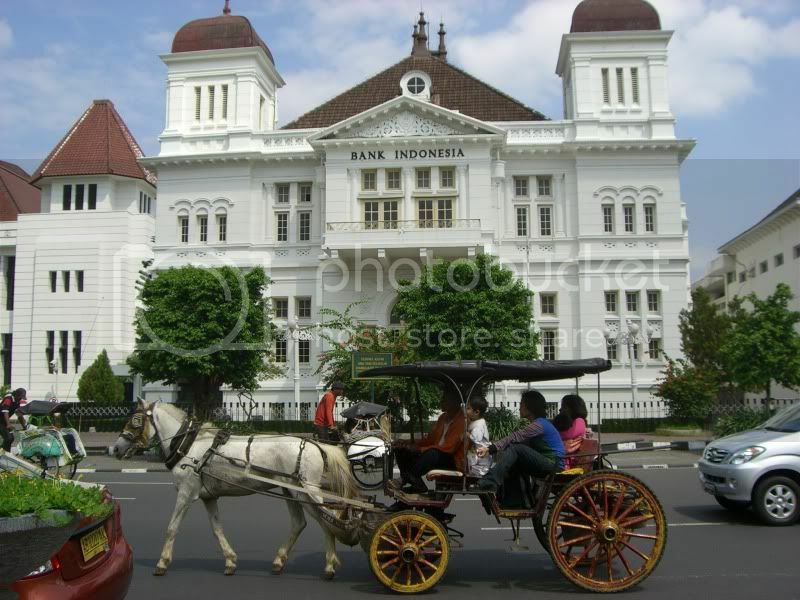 The trip costs IDR3,000 takes and about 20-30 minutes. Get off at Jalan Malioboro. Before you get on, ask the attendant in the booth to tell the driver where you want to get off. Merbabu Hotel. It's on a small lane off of Jalan Sosrowjiwan ("Soswro" for short), the main budget travelers' street in Yogyakarta. Get your taxi to drop you off on that road, just next to the big yellow sign for "Superman Restaurant." Walk into that alley, and eventually you'll see the hotel on your left. I spent IDR95,000 (US$9.50) a night for a big, airy room. Only cold shower, though. Free breakfast included, and it's a good breakfast. Your choice of tasty dishes like banana chocolate pancakes, fried-egg sandwiches, etc. No Internet, but there are Internet cafes around. I love the location of the place. There are two secondhand bookstores right outside. Lots of backpacker-oriented restaurants around, too. Although I didn't like the food at Superman Restaurant. There is a more upscale travelers' row on Jalan Prawirotaman. The hotels, restaurants, and even the main Internet cafe all seemed a lot nicer than the places on Jalan Sosrojiwan. A bit more expensive, but seems worth it. The one drawback is that it's a bit further from things. The best way to get around is using TransJogja bus, a modern bus rapid transit system. The buses are small, clean, air-conditioned, and much more comfortable than the full-sized public buses. The website is bare bones, but here is a link to a list of bus routes. The closest station to Jalan Soswrojiwan is on Jalan Malioboro, across from the Yogyakarta Library Center. Usually there will be at least one attendant who can speak enough English to help you. Just tell them were you want go. Have them write down for you what buses you may have to transfer to, and the name of the bus stop you should get off at. 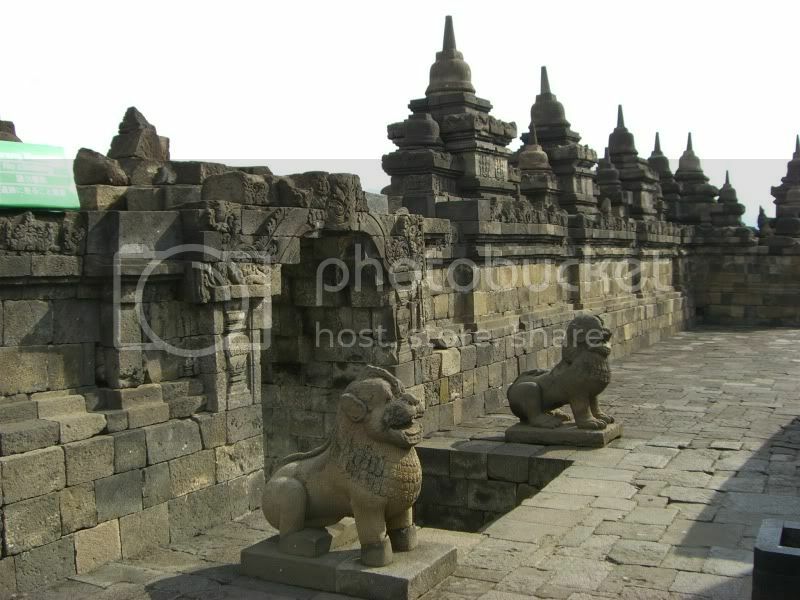 The main attractions in Yogyakarta are the temple complexes of Borobodur and Yogyakarta. 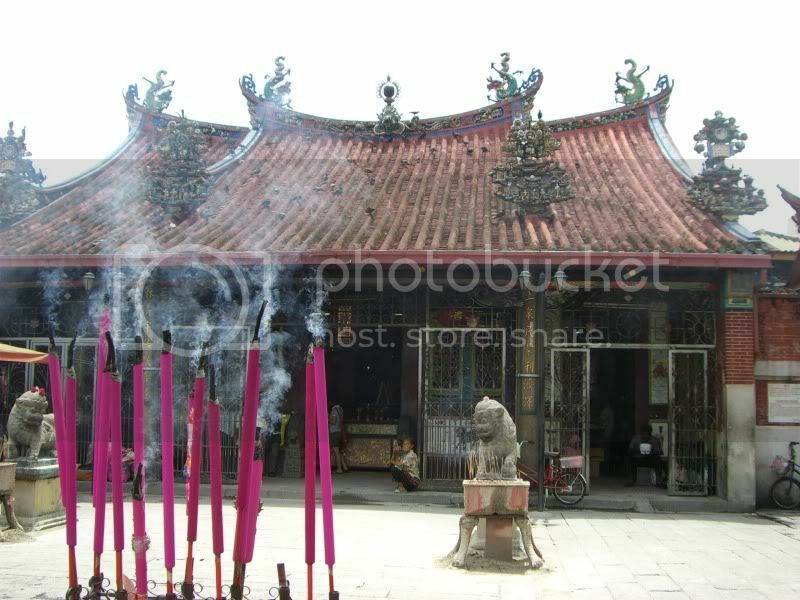 There are tons of tour companies on Jalan Soswrojiwan who can arrange a trip to the temples for you. They're not guided tours, they only provide door-to-door transportation to the temples. I was there during low season, so the tour companies had trouble finding enough people to launch a tour. I ended up taking crowded, dirty public buses to the temples. A tour costs about IDR50,000 (US$5.00), while public buses cost a fraction of that, with an equivalent fraction of comfort. I found out later that I could have taken TransJogja buses to the the temples. I'd recommend this. 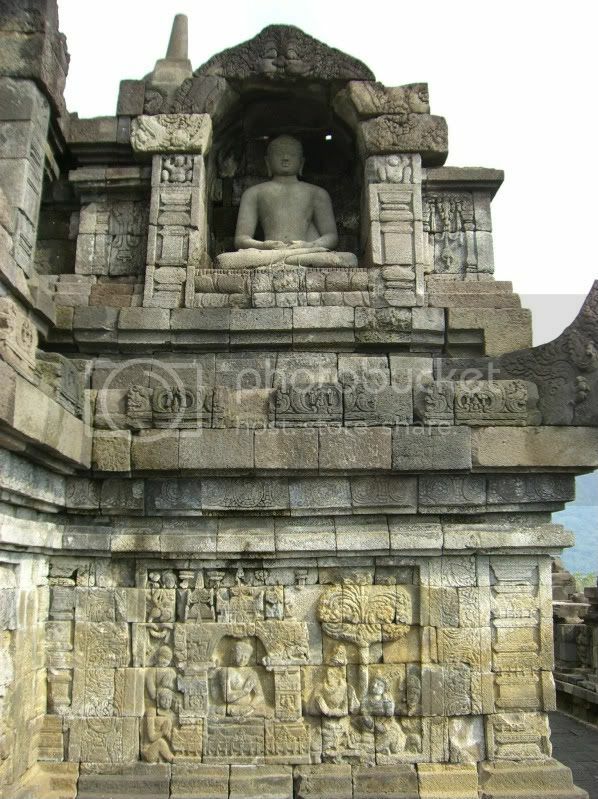 --To Borobudur, take Bus 2A on Malioboro and transfer to Bus 2B later, the attendant will tell you how to do this. If I remember right, you get dropped off at Jombor bus terminal and still need to take a public bus for the final leg of the journey. When your public bus arrives in the parking lot, touts will jump aboard and try to get you to hire them to take you around in a horse carriage. They'll make up excuses that it's too far and too hot to walk to Borobudur. Ignore them. The bus stop is only about a 10-minute walk to Borobudur. 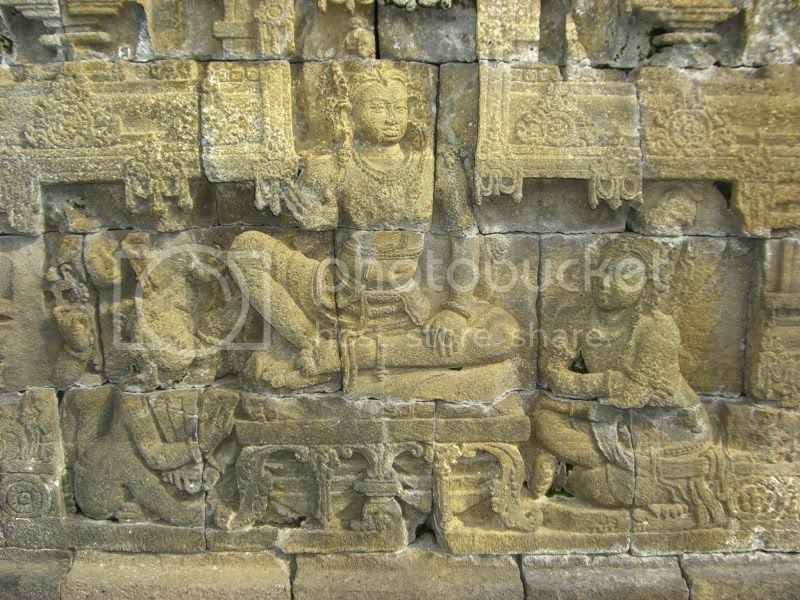 They'll also try to take you to Candi Mendut and other lesser temples. 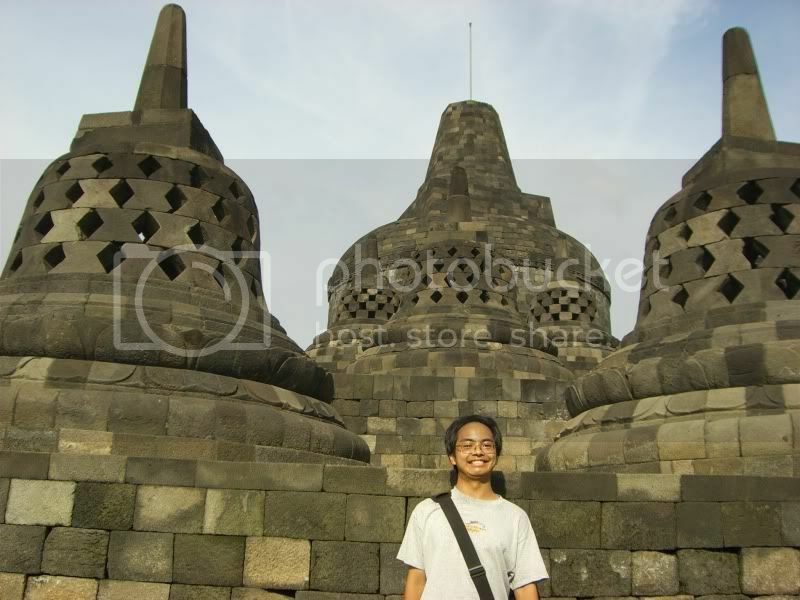 In my opinion, they're not worth seeing and can't compare to Borobudur. 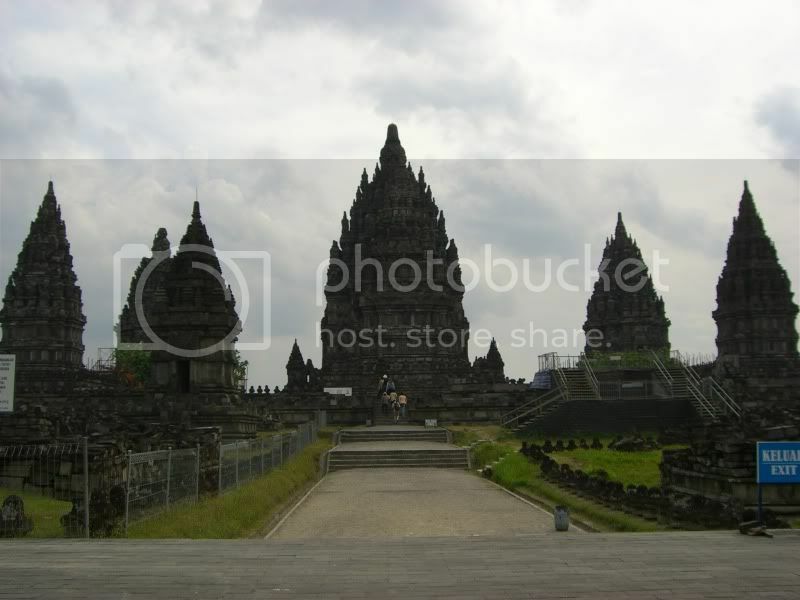 --To Prambanan, take Bus 1A on Malioboro. 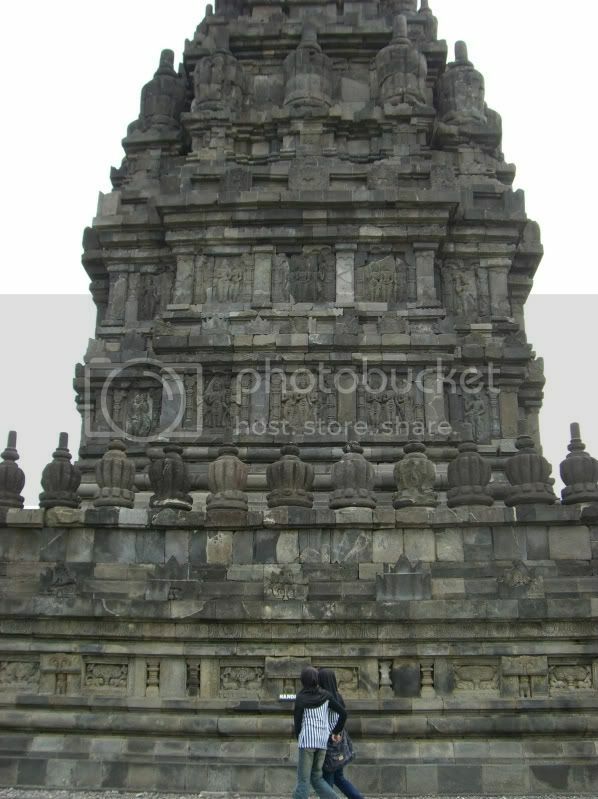 The bus stop is about a 20-30 minute walk to Prambanan. You may want to hire a motorbike driver to give you a ride there, that's what I did. Via Via Cafe on Jalan Prawirotaman is a great restaurant, and also offers a number of alternative tours. From what I read in the brochure, they sounded a lot more interesting than the standard tours all the other companies offered. 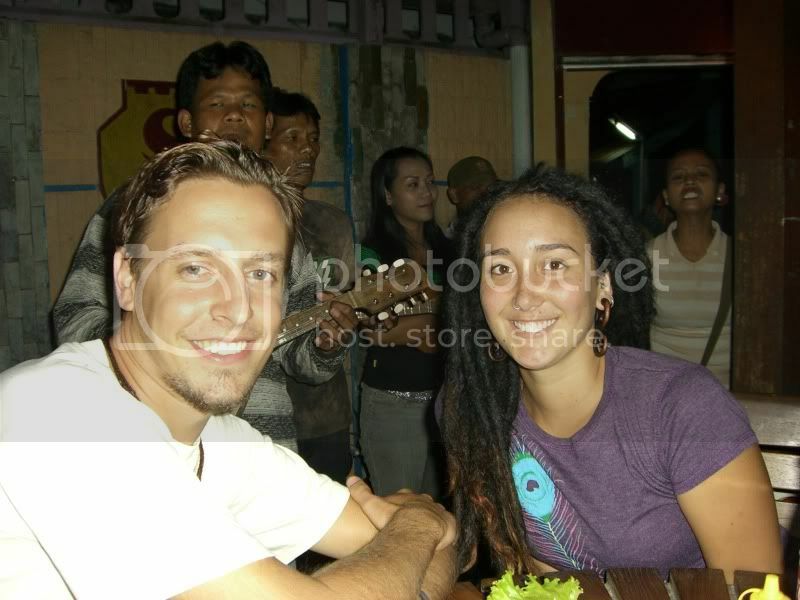 One of their most popular tours is to travel overland from Yogyakarta all the way to Bali island. That's "Tour 7: Overland East Java." This trip includes a journey to Mount Bromo, an active volcano. A good source of travel information is YogYes.com, which was told to me by the excellent Peter and Jacqueline. Cinema XXI is part of the Cinema 21 chain. You can get a taxi there in 15 minutes. It's a plush, luxurious cinema, and tickets only cost IDR15,000 (US$1.50)! The downside is that movies are really old, from like 1-2 years ago. When I was there, I saw a poster saying "Coming Soon! Body of Lies," the Leonardo DiCaprio spy thriller. Good movie, by the way. Peter and I went there to see Crank 2: High Voltage. Penang is the bizarro version of Hawaii. Both places are a blend of Western and Asian influences, except those influences are different. 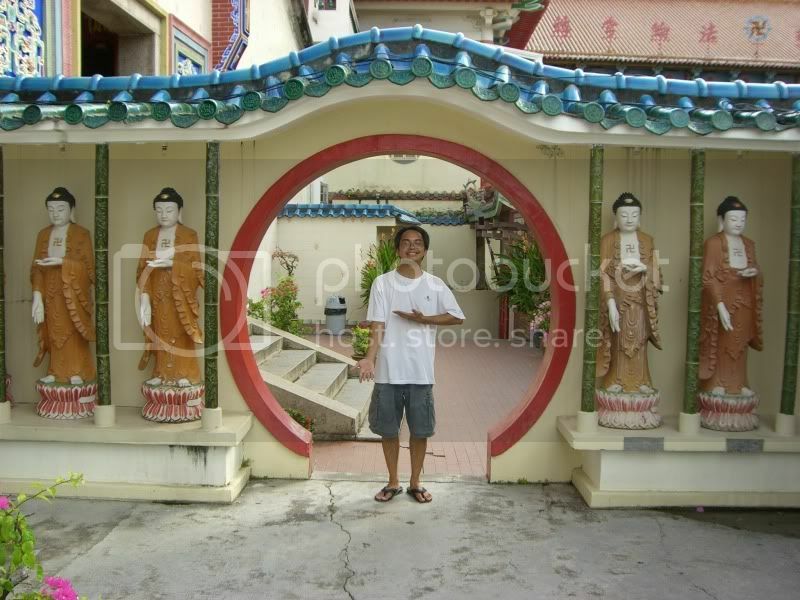 Hawaii is American and Japanese, while Penang is British and Chinese. It was like being in a parallel universe. I'd wonder, "Could Hawaii have ended up like Penang?" Maybe if the British had kept control of the U.S., and if more Chinese had settled in Hawaii rather than Japanese. After staying in the small town of Tanah Rata in the Cameron Highlands, I was happy to be in a modern city like Georgetown. 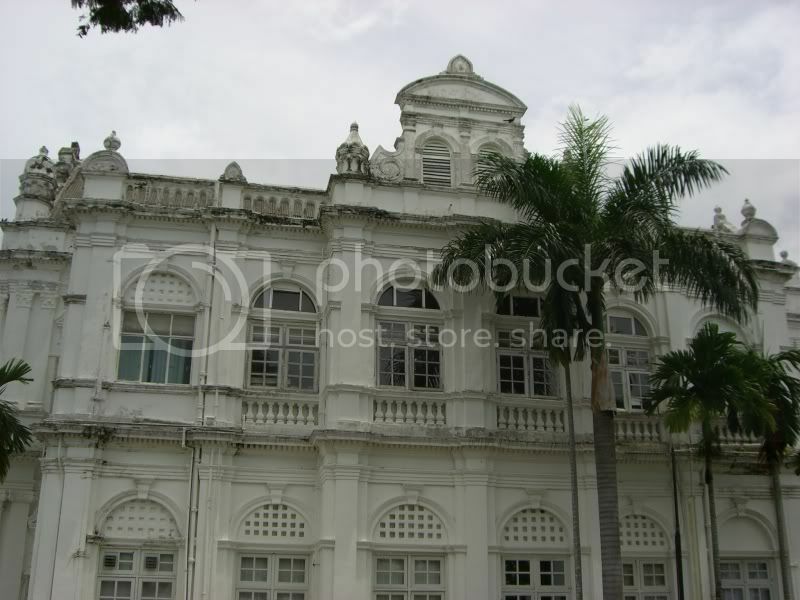 It's the main city in Penang. 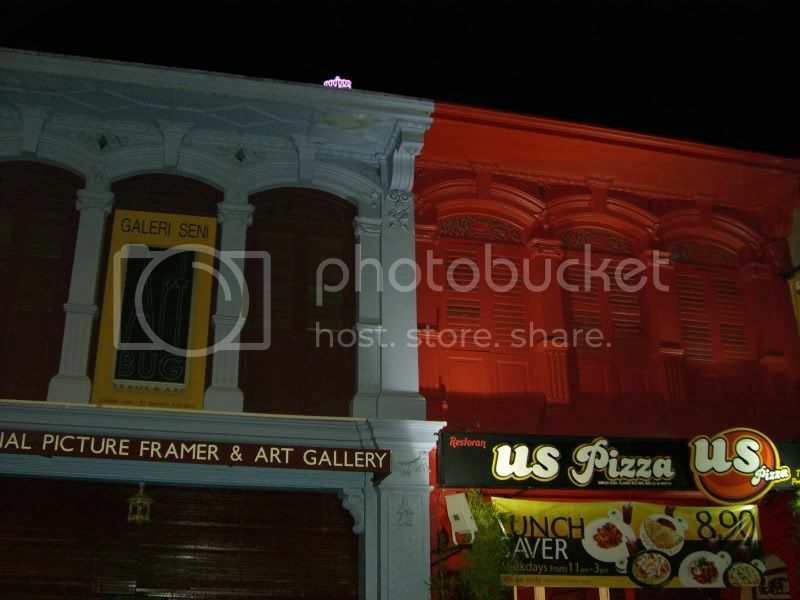 While Melaka felt like a fairy-tale town, Georgetown had more buzz, it was a place to take care of business. I've lost the American habit of trying to see as many sights in the shortest time. I can easily lounge around for a whole week if I feel comfortable in a place. The Americans I meet on the road are usually in the biggest rush. When I run into English, Canadian or Australian backpackers, often they've been traveling for months or years at a time. When my hostel or guesthouse has a nice common area and cool people around, it's easy to be a sloth. I'll happily spend hours chatting with travelers. On the other hand, annoying people drive me away. For a more detailed rant, see my past blog post, Ugly Foreigners. Back to people I want to spend time with. Sometimes I'll wait until there is a critical mass of other backpackers who are going to see sights at the same time. Then I'll join them. 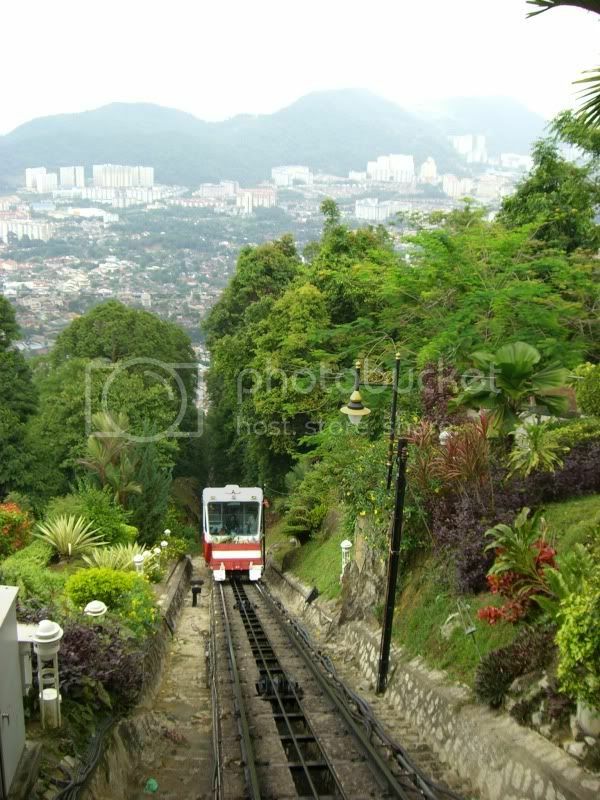 I did this with Penang Hill. It's popular to take the funicular railway to the top. 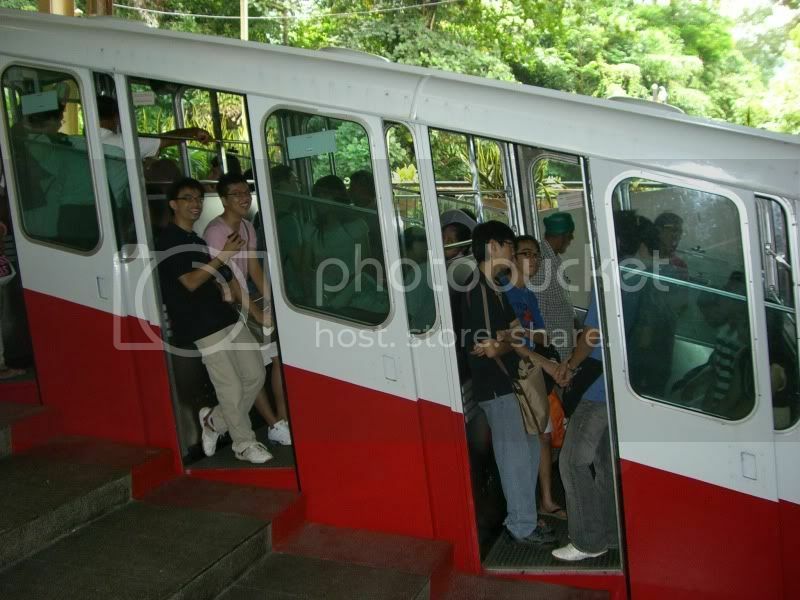 Similar to the Peak tram in Hong Kong that goes up Victoria Peak, it's a train that designed to go uphill. Penang Hill is pretty and green at the top. But there isn't much to see besides a small, colorful Indian temple. The main reason to go is to see the view of Georgetown. Riding the train and chatting with fellow backpackers was the real highlight. Most of my friendships were made at Hutton Lodge, the hostel I stayed in. We were all relieved to be somewhere modern. Malaysia is relatively under-touristed compared to nearby Thailand. Similar to its geography, Malaysia's state of development lies somewhere between Thailand and Singapore. We had a nicely eclectic group: Susan, a Canadian backpacker and Arif, a Pakistani-American guy who worked as a financial analyst. There was also a Scottish-Estonian couple, Kris and Kadri, who were riding a motorcycle and traveling by overland to Australia. They had passed through Iran, Pakistan, and India on the way. Their stories were amazing. Chris (Scotland), Susan (Canada), Kadri (Estonia) and Arif (United States), waiting for the funicular train. What I liked most about the couple was how refreshingly friendly and unpretentious they were. Other travelers who get around overland the hard way can be disgustingly smug and treat people who take planes like wimps. They didn't endlessly brag about traveling to danger zones like Iran and Pakistan. And I thought I was brave for going to Burma! 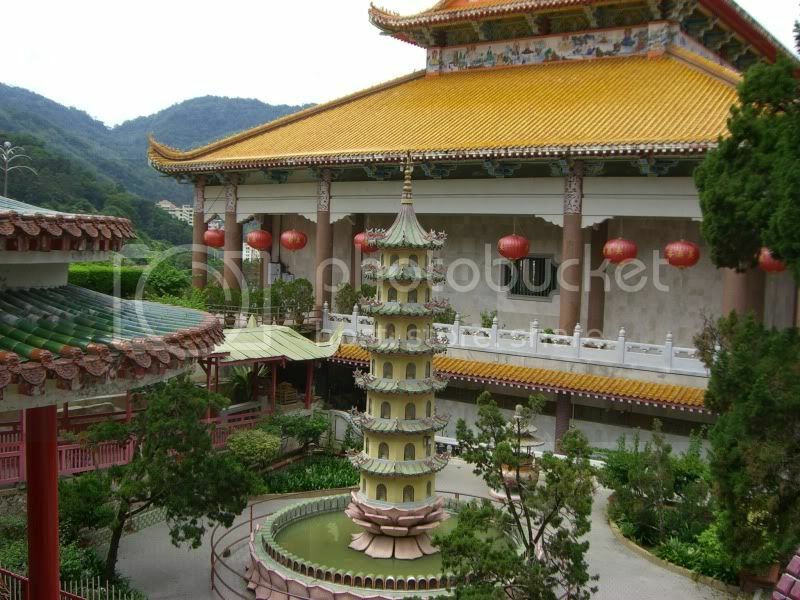 The next stop was Kek Lok Si Temple. My favorite temples are the ones that are more like complexes, with lots of buildings and rooms to explore. Kek Lok Si was like this. A groundskeeper watering the plants. 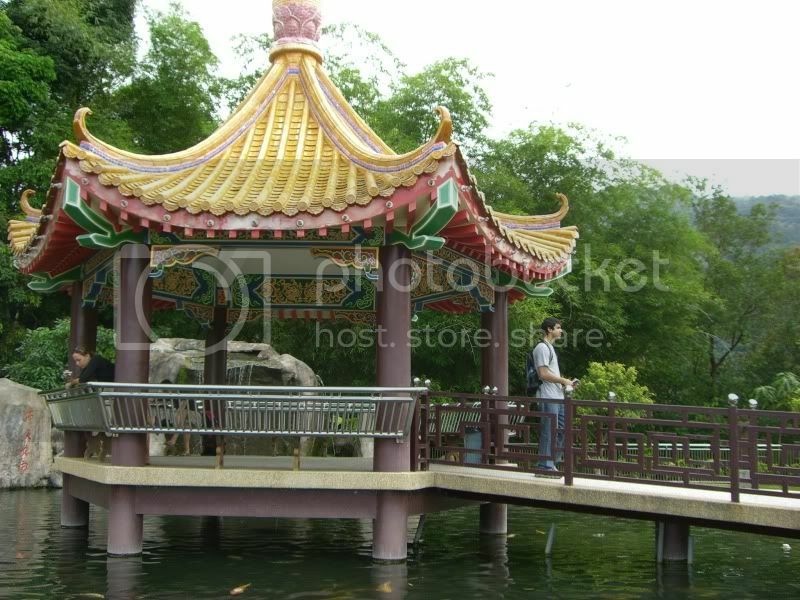 Arif meditating at a pagoda in the center of a pool. It did have one annoying trait in common with attractions in Beijing: separate fees for every zone you walk into. The biggest rip-off was when we paid an extra fee to go to the top level, where the guidebook said there was a massive statue of Mazu. 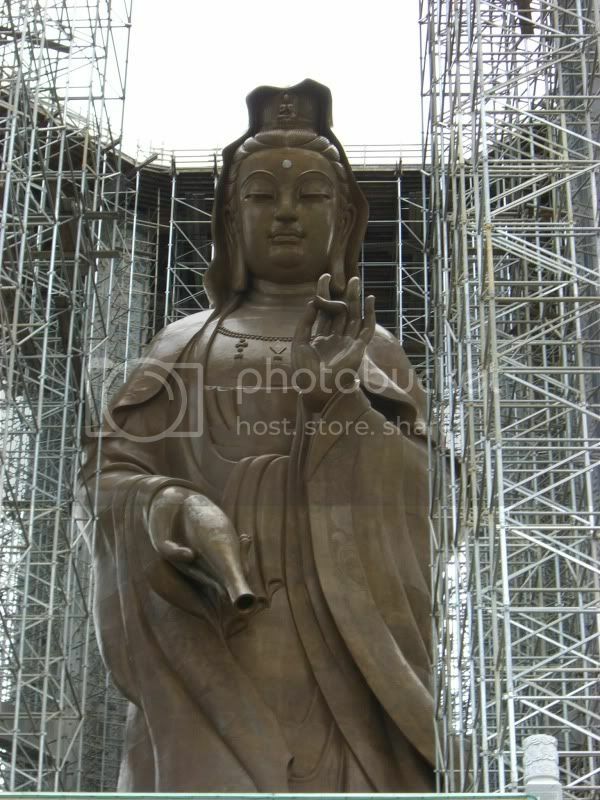 She's the Chinese patron saint of sailors and fishermen. The statue was surrounded by metal scaffolding! We were so pissed off. I hate it when that happens! Thankfully, the front of the statue was exposed, so we could still take pictures. 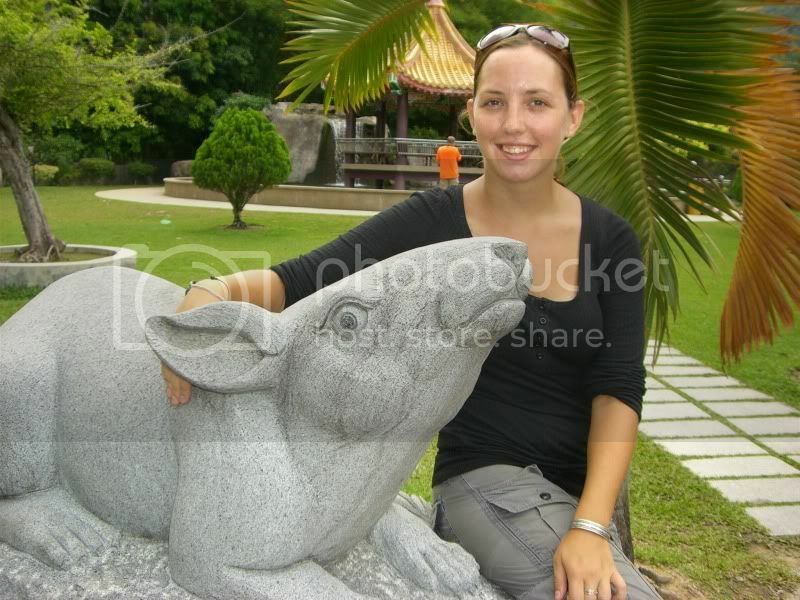 What was more fun, we found a small sculpture garden with statues based on animals in the Chinese zodiac. We had a blast while posing for photos with the animals that matched our horoscopes. Me with the Pig. Susan thought the pig looked stressed-out and constipated. 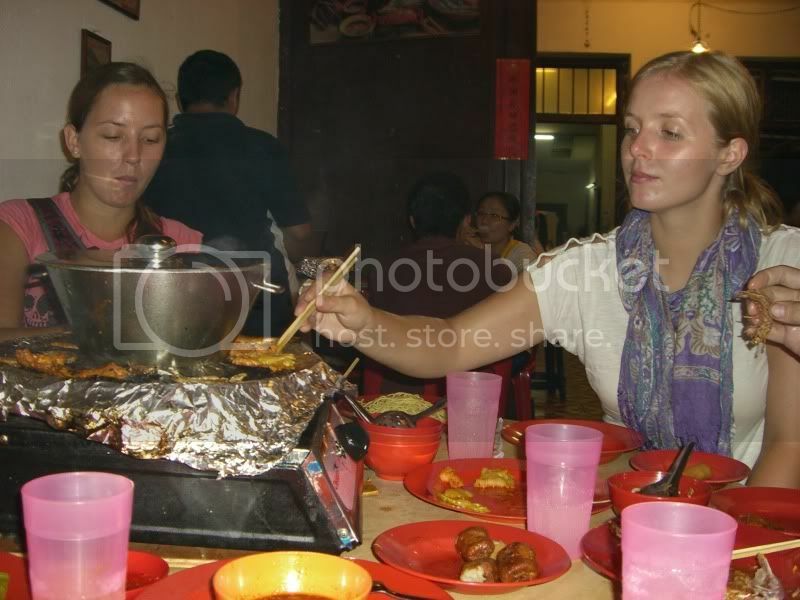 For dinner one night, we headed to a row of Chinese shophouses near our hostel. 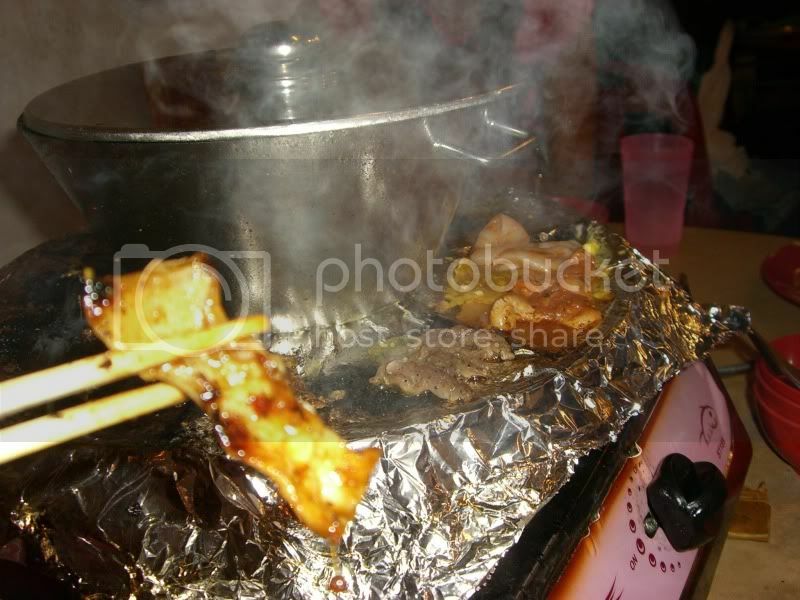 We ended up eating "steamboat," similar to hotpot I've eaten in China and Taiwan. The owner, a jovial Malaysian Chinese man, eagerly gave us a tour of his restaurant. The owner explaining the dishes to Susan. You throw vegetables and meats into a boiling pot, then eat. The main difference was that you could also fry your food around the bottom rim of the pot. But you pick and choose various condiments to make your own personal dipping sauce, just like hotpot. Susan and Kadri dining on steamboat. The magic ingredient is sha cha sauce. It's the ultimate savory sauce, made up of soybean oil, garlic, chillis, brill fish, and shrimp. You can dip anything in it, and it'll taste mind-blowingly good. When my Canadian friend Brynn brought her mother to a hotpot restaurant in Taipei, her mother fell in love with the hotpot concept. She vowed to hit a Taiwanese supermarket and buy big jars of sha cha sauce to take back to Canada. Nowadays, I take as many photos of food as I do of big sights. I'm turning into an Asian tourist! 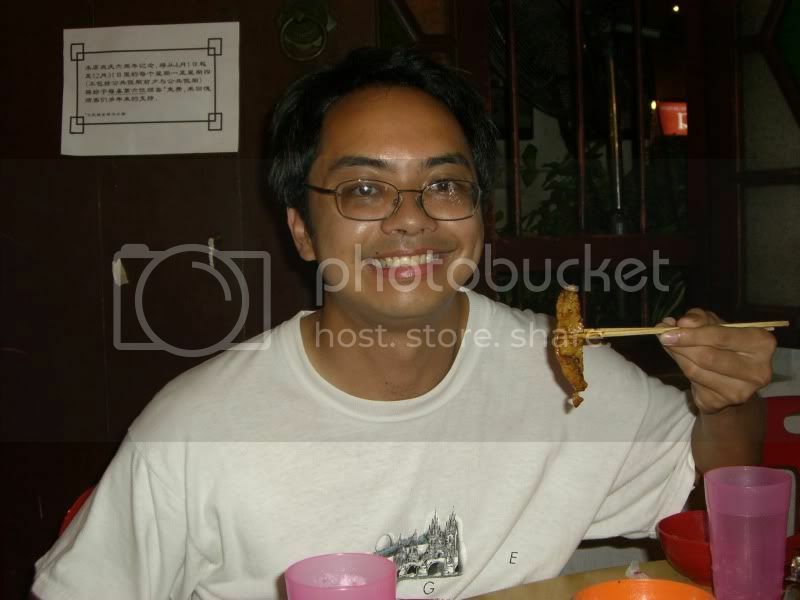 The author, enjoying some great food. Butterworth, a boring industrial town on the Malaysia mainland, serves as the main transport hub to the island of Penang. All buses stop there and the railway ends there. From Butterworth, you can take the ferry across to Georgetown, the main city on Penang. The ferry jetty is only a short walk from the Butterworth train and bus stations. The ferry is the best and most scenic way to go to Penang. Once you arrive at the Weld Quay ferry jetty in Georgetown, ask around until you find the free shuttle bus. It goes from the ferry jetty to some of the popular spots in the city, including Komtar Complex (a shopping and transport hub) and Lebuh Chulia (main backpacker road). Buses also go to Penang via a causeway bridge, but they drop you off at Sungei Nibong bus station, an unremarkable 15-minute drive from Georgetown. Stick with the ferry from Butterworth. Hutton Lodge is the best hostel I've seen in Southeast Asia. Designed like a boutique hotel, it offers the charm of a colonial-style building, and the comfort of a modern hotel, at reasonable prices. When I first walked in, I was worried that the hostel was gone and it had been taken over by a luxury hotel. Hutton Lodge is that nice. Banana New Guesthouse is a well-known place, but it's often fully booked. Very popular with Western expats doing a visa run from Thailand. I get the feeling that they make their real money from their visa services, and the cheap rooms are just a way to bring in customers. Otherwise, it's best to walk around Lebuh Chulia and check out places in person. There are plenty of budget options. Red Garden is the best hawker centre in Georgetown, with a huge selection of food. At night, there are cheesy singing and dancing performances on the main stage. Similar to the singing you see at Asian banquets and weddings. Penang is a good launch point to go to Thailand or Indonesia. Many guesthouses (like Banana New Guesthouse) offer visa services for both countries. It's probably better to just pay for a cab and go to the consulates yourself. 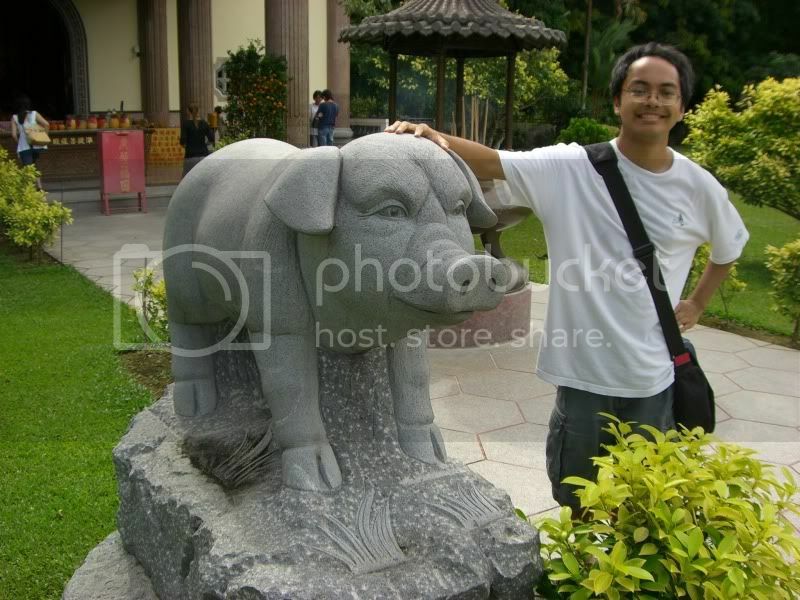 I almost got a 60-day Indonesia visa through a visa agent. But I thought the guy was way too high-pressure, so I canceled it. Most bus companies have ticket offices at Komtar Complex in the city center, but you may have to board the buses at Sungei Nibong bus station outside of town. Konsortium Express Bus offers a shuttle service that will take you from Komtar to the bus station, for a small fee. I imagine other bus companies do this too. Konsortium has nice buses, I recommend it. Most Thai-bound buses go through Hat Yai, a border town on the Thai side. RM22, takes about 4 hours. I've heard from travelers that taking buses to Thailand involves changing buses and long waiting times in between. It might be more convenient to catch a train at Butterworth. Here's the link to the Thai Railway timetables. The Southern Line goes from Malaysia to Thailand. Surat Thani -- the main gateway to the East Coast Thai islands, like Ko Samui, Ko Tao (good place to study diving) and Ko Pha Ngan (the famous full-moon party). 14 hours. From Surat Thani, you can also take a bus (3-4 hours) to Krabi, the gateway to West Coast Thai islands like Phuket and Ko Phi Phi. Bangkok -- Thailand's capital. 23 Hours. Visas: At the time of writing, you only got 14-day visas on arrival if you get there by overland. If you're going to spend more time in Thailand, get a visa in Penang beforehand. You get 30 days if you fly in. Ferries from Penang go to Medan in Java. RM150, 5 hours. Boats depart from Georgetown's Swettenham jetty and land in Belawan. The rest of the journey to Medan is done by bus (cost should be included with boat ticket). Visas: You can get a 30-day Indonesian visa on arrival. If you're planning on traveling around the country for longer, get the 60-day visa in Penang before you arrive.